Therapeutic benefits of Cilantro (Coriander) are many, it is a herb that is used extensively around the world as a condiment, herb, dried or the seeds are used in traditional Asian dishes. – Aids digestion by increasing enzyme secretions and digestive juices. – Promotes endocrine health and menstrual regulation. At Maya’s Organic World, our significant recent interest has been related to detoxification of heavy metals. Adding a small bunch of cilantro (that has been soaked in organic apple cider vinegar and washed a few times) to a smoothie has proved beneficial after amalgam removal. A noticeable reduction in nerve pain, neuropathy, vertigo, headaches and fatigue. Cilantro is a metal toxin binding agent, wards off uti infections, high in iron and magnesium, promotes liver health. 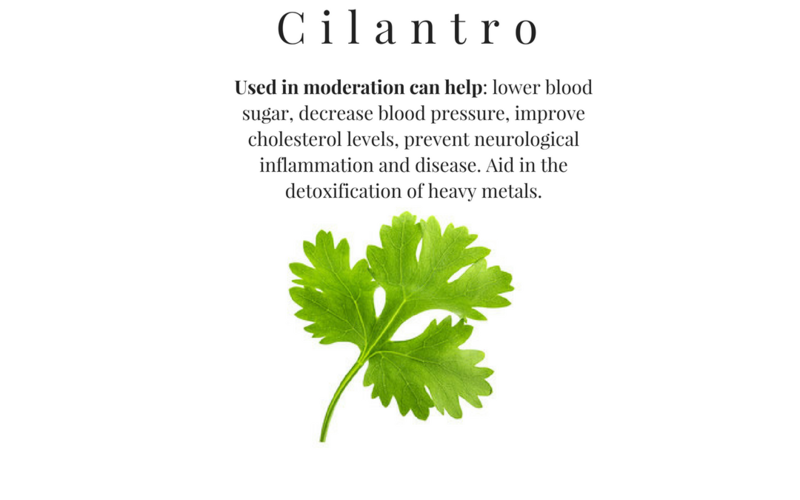 Alternatively cilantro can be used in: vegetable curry, meat curries, burgers, Mexican food, kebabs and salads. You can use it as a garnish too. Detoxification can vary from individual to individual. Please note any information taken from our instagram page or blog must be done so using your own informed decisions. As with all herbs you must eat them or juice them in moderation. Great article! I loooove cilantro.